With the release of an updated model from Dell, there always seems to be a large amount of discussion about it's performance. There also often seems to be discussion of issues which cause concern for many prospective buyers. When the 2407WFP, 2007FP and 2007WFP were released last year we discussed the changes made in the new models, along with the infamous 'banding issue' which plagued early models and became a hot topic of discussion. With the release of the updated HighColor edition of the 2407WFP (now labelled with 'HC'), the screen offers an improved colour gamut covering 92% of the NTSC colour space. The model also features a slightly different panel from Samsung, their recently added LTM240CS01 S-PVA panel. With the new model comes reports of new problems unfortunately. It's not clear how widespread these issues are at the moment, and the situation seems more pronounced on some screens than others. Some users have reported them (with evidence) on their new screens, and many others are seeing no such issues. This is the first issue which some users have reported and seems to be most pronounced on grey backgrounds. It is defined commonly by a green ghosting trail behind moving images. This seems to be related to a poor control of the RTC (Response Time Compensation) technology used to boost responsiveness in the S-PVA panel. This is unfortunately a common issue with Samsung screens where aggressive overdrive is used to boost response times on their panels, but its application is poorly controlled. Some screens such as the 940BF (TN Film based in this instance) show some 'overdrive trailing' and users have often had to resort to switching the RTA function off in the OSD. With the Dell 2407WFP-HC there is no such option available, but many users have found that this issue can be fixed by a simple calibration of the RGB colour levels within the OSD (see below in fixes). Full calibration with a colorimeter is also likely to help significantly here. "I recieved the monitor earlier this month, and right out of the box knew there was something a bit off. I noticed dark "after-images" from any light-colored objects that passed across a dark texture on my screen. Be it my white mouse cursor passing over a dark background, or a lightly-colored character running across a dark brown patch of dirt in-game, it does this weird ghosting effect except the ghost is black. It only shows up on non-black textures, but it's something that I have never seen before. It's almost like the pixels have to shift to black before they can shift to the new color." He also posted a useful video showing the artefact well. It seems that several users are reporting this problem, but others are not seeing it on their screens. This could just be down to how susceptible people are to these kind of issues, or it could be that the issue varies from one screen to another. Switching interfaces seems to have no effect here, and changing graphics card, motherboard and software / drivers seems to make no difference. The issue looks like it could well be at an electronics / panel level. It also seems that this issue becomes more pronounced the longer the screen is left on. When first switching the screen on, the issue is harder to spot, but after a couple of hours it becomes more obvious. How Can I Attempt To Fix This Issue? This problem seems to often fix issues with green trailing, but most users report it has little to no effect on the black ghosting issue which seems more severe. 2. 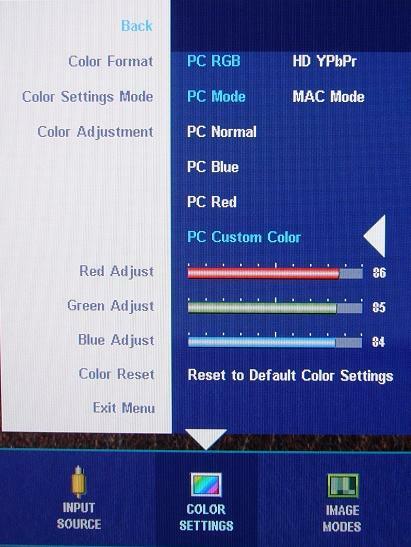 Access Display Properties within Control Panel > Settings > Advanced > Color Management > Add > Select ICM color profile. Despite the above suggestions being tried, many users are still reporting that the ghosting issue is still obvious and is very distracting during use. It seems the issue is most likely related to the control of the RTC impulse used to boost response times across grey transitions. This is unfortunately a common issue with Samsung panels in some models, and the 'overshoot' in this case is quite pronounced. My advice would be that if you are not seeing any real problems, don't bother to go looking for it as it will only annoy you. If you have tried the above suggestions and still have no luck, for the time being we will need to wait for a solution or fix from Dell. Swapping the screen under warranty is unlikely to help since the problem is probably widespread and an issue with all current stock. The 2407WFP-HC is currently in it's A00 revision stage, so maybe we will have to wait for Dell to update to A01 before we see a resolution. On 23/8/07 ChrisM (Dell representative on their forums) posted saying that "It will take us awhile to reproduce and document the issue. Then, we must send it to the manufacturer to get corrective actions. This will take time. If you do not want to wait, return the monitors." On the 28/8/07 he followed up by saying "All, Give us time. We are working this." and on the 29th stated "Hold off on getting any replacements until I give the word." At least Dell have acknowledged the problems reported and are working towards a fix. On 1/9/07 ChrisM went on to say: "This will take us some time. The guys in the lab on friday said they could not reproduce the issue playing WOW. I need your complete specs to know what your using". It might well be that we have a bit of a wait before a fix is available. Then more recently on the 5th Sept he said ""I am currently waiting for the official response to this issue from my Displays Product Group." I would imagine that, as with the 2407WFP banding issue, this could be resolved with a firmware upgrade from Dell. Once this is released you would probably need to arrange a swap with Dell if you have issues with your current screen, since upgrading yourself is very unlikely to be possible. Further details about this issue will be posted in this article as updates when they become available. Update 6/9/07: - ChrisM came back with some feedback from Dell's testing, saying "We had success in the lab testing two 2407WFP-HCs. We forgot that a huge difference between the 2407WFP and the 2407WFP-HC was that we added the Contrast ability to both the VGA and the DVI of the 2407WFP-HC. Using the PixPerAn software Mobious showed us, we set the Brightness to default 50 and slowly moved the Contrast up/down (I cannot remember what was the best number) while running the F3 Chase Test. We greatly lessened the Ghosting. Everyone, start WOW and adjust your Brightness and Contrast accordingly. Please post your results." However, users were quick to report back that this seemed to make no real difference to their black ghosting usses. More importantly for some people he also said "NOTE - If you guys go through me, any exchanges will be for a New monitor regardless of days outside of 30. We are not yet ready to start these exchanges." I'd recommend that for those experiencing issues with their 2407WFP-HC, that they sign up to the Dell forums and PM ChrisM as above for now. I can say that there will NOT be any in-home bios flashing of the monitors. If they decide that a fix can be implemented by bios flashing (which is just conjecture at this point), this will be done by us on the factory level....We are looking for the root cause. When/if we discover it, we will setup a corrective action and notify you members of the DCF (Dell Community Forum), the direct2dell blog, the OC Forum, and the HardForum. But, we will not make an announcement in the New York Times." Update 12/9/07: - ChrisM reports some good news! "I got an update this morning. Root cause has been found (Dell Confidential, don't ask). Next, we move into the discussion phase about what the manufacturer can do etc. Give us time.". It's not clear where the problem lies, but they were investigating issues with RTC control as detailed in this article. Perhaps that is the problem. Regardless, the important thing is that they have found the cause and are investigating further. Update 16/9/07: - There was a bit of confusion recently when ChrisM initially posted a reply to a member of the DCF stating they hadn't found a fix for the issue. However, Chris has been in touch with us here to confirm that "We HAVE found the root cause and are working towards a response and/or fix with our manufacturer. IF there is another revision, you will all be able to initiate an exchange for this new revision. All I can do is await the response from our manufacturer." Note that for the purpose of this article about the ghosting issue, I can confirm that the black ghosting was detectable after the screen had been on for a short time. Even calibration with a professional colorimeter did not correct this unfortunately. Update 25/9/07: - While Dell are still working towards a hopeful fix, several users have questioned how a possible firmware flash would work. ChrisM confirmed that this would NOT be possible from the user end: "Would it be technically possible for Dell to make available an update file that users could run themselves without having to return the monitor? (answer)* No." As thought, any possible firmware upgrade would involve returning the screen to Dell, and for those in the US, this can be done via Chris on their forums as linked below. Update 28/9/07: - ChrisM has clarified a few points to the users of DCF regarding the issue. Dell will not be releasing information about what they have found to be the root cause until the manufacturer gives them the go-ahead. He also states that "98 percent of the buyers of this monitor use it in such a way that they do not see the ghosting. We cannot even produce the ghosting playing WOW in our lab." The technical desks throughout the Dell organisition will not be aware of the problem yet either, since "We would not notify Sales, Care, or Technical Support until we formulate a plan of action. Which has not been done, yet." I doubt we will see Dell acknowledge there is a fault as such with this screen since it could open up the doors to many more exchanges from users who don't even see a problem with their screen. We will have to wait and see, but have faith that Dell are investigating, and are certainly aware of all the user complaints. (Auto translated) "To answer a questioning crossed on the forum: the 2407WFP-HC is him affected by a particular ghosting, an unusual bleeding, a RTC managed especially (overdrive) badly or by displays of blue, or green, or red, inopportune lines: no, nothing of all that! "Our" 2407WFP-HC had an absolutely normal behavior and to our representative opinion of the screens on sale, dan measures it where his/her/its display is identical - in terms of reactivity - to the one of the precedent 2407WFP. - affected of bleeding, ghosting, of pictures dark ghosts bound to a bad gestionde the overdrive, unsettled by the inopportune display of colorful lines: as one can find these shortcomings described mainly by some first users of this monitor on US sites: as seen in the page bound to the reactivity of the monitor: "our" 2407WFP-HC displays a behavior one is not able to more normal on all these points. Anything of all this has not been met at the time of the tests. On the contrary, the overdrive is managed particularly well, with a reactivity finally discerned close to the one of the screens fastest TN. He/it is effectively question of a correction of the firmware intervened a short time after the launching of the first sets. To all strokes, our version has been put up to date. it would explain besides why Dell, usually so expeditious to send us some monitors in test since their exit, took this time several months to send us a trial copy." Update 4/10/07: - ChrisM confirmed on the Dell forums that "All, I have not received any news about a new revision in France or anywhere else." 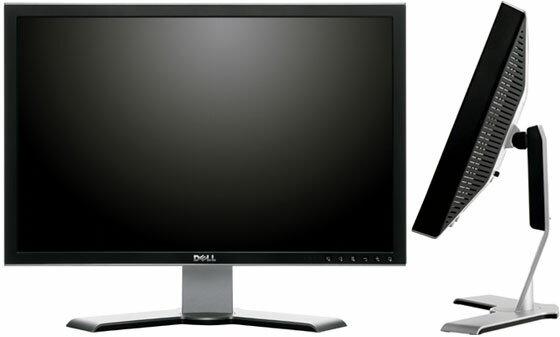 "Dell has received feedback from some customers regarding our new 2407WFP-HC monitors. The majority of this feedback has been positive but some customers have made inquiries regarding a ghosting trail behind a moving image. This effect is known as "overdrive ghosting" and, while not typically experienced with general monitor use, it may be seen from time to time when viewing patterns on a lower greyscale background. This "overdrive ghosting" effect is tied to the overdrive feature of the LCD panel. The overdrive feature helps to deliver impressive picture details and quality across a wide multitude of usage models by improving the grey-to-grey response time. However, when the overdrive feature is coupled with a faster monitor response time, the potential for overdrive ghosting can occur in some viewing patterns." This was followed by an email to those who have posted in the DCF thread and further points raised on the forums. The jist of it is that there will not be another revision of this monitor produced with a 'fix'. Users have the option of either sticking with their screen or returning it for a refund. Chris also later clarified a few points for the users: "my only option are to be credited or be stuck with the monitor = * Correct." and "Are you saying that Dell are not going to release another revision with the "feature" removed? - * Correct. We are not." At least we now have confirmation from Dell as to what the problem is, and as we thought, it was related to the control of the RTC impulse. However, sadly, Dell will not be implementing an update or 'fix' for this, presumably either because it will not be possible, or because there aren't enough complaints to warrant a drastic change. It could well be a problem inherant to the S-PVA panel used, and since there aren't really any alternatives which would offer the HC feature (92% NTSC colour gamut), they can't really abandon the panel due to this issue. I'd suggest that if anyone wants a refund or has any feedback, they sign up on the DCF and join in the discussion.